Making Potato Salad in the Instant Pot is quick and easy. Use this method as a starting point for your favorite potato salad recipe or use ours—it’s an American classic combining mayo, onions, relish, and a little mustard. I’m guessing that there are at least a million ways to make potato salad. In fact, I bet that’s a low estimate. Everyone, it seems, has the “perfect” recipe. This isn’t that recipe. 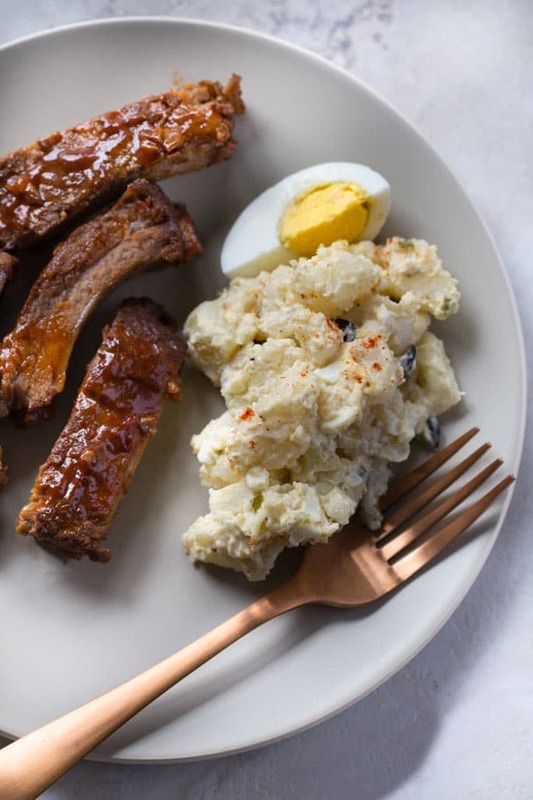 This is a method for preparing potato salad in the Instant Pot. 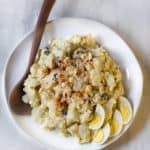 Why Make Potato Salad in the Instant Pot? It Keeps Your Kitchen Cool. Boiling potatoes in hot summer isn’t fun. 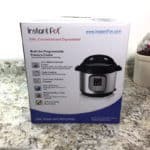 Using the Instant Pot keeps the kitchen cool. The Flavor. There’s something about pressure cooked potatoes that always taste more…potato-y to me. The Texture. Pressure cooked potatoes are nice and creamy. Unlike boiled potatoes, they don’t end up watery with mushy edges. And compared to baked potatoes, they aren’t as dry. 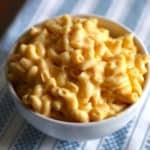 The texture is perfect for potato salad. Select an all-purpose or waxy, not starchy potato for potato salad. Peel and cut the potatoes into small cubes. Don’t cut them any smaller than 3/4- inch or they can overcook turn into mashed potatoes. 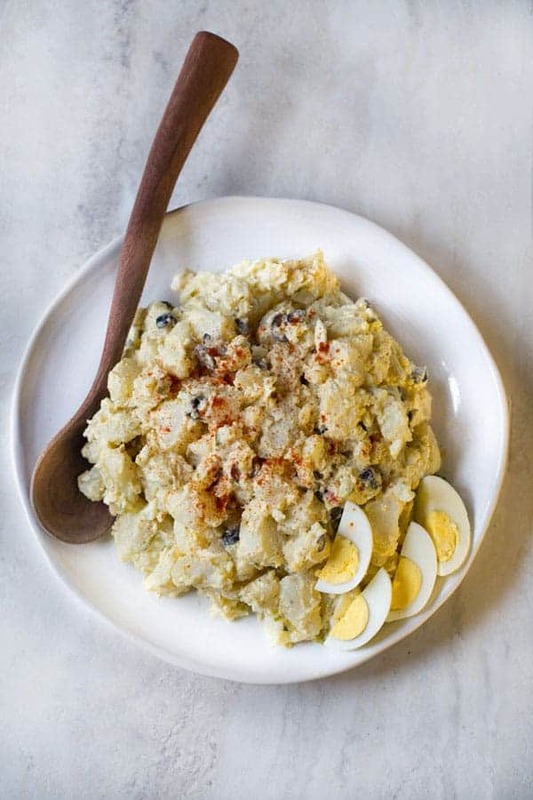 If you like hard boiled eggs in your potato salad, cook them right along with the potatoes. Set a small bowl filled with ice water next to the pressure cooker. After venting, transfer the eggs to the ice water. This prevents them from overcooking. Add water and set the cook time for four minutes. That’s it. The cook time seems impossibly short but, as long as your potatoes aren’t cut too big or too small, it works. When the cook time ends, release the pressure using the quick release method. Transfer the eggs to a bowl filled with ice and water to cool. This keeps them from overcooking. Then spread the potatoes out onto a greased rimmed baking sheet. Allow the potatoes to cool for about 20 minutes or until they are no longer giving off steam. Cover the pan with plastic wrap and chill. If you like to flavor your potato salad with vinegar, sprinkle it on the potatoes while they are hot. You can do this right on the baking sheet. Combine the cooled potatoes, chopped hard boiled eggs, and dressing in a large bowl. Stir gently. Then add your favorite ingredients, I like dill pickle relish, chopped onions, and black olives. Season with salt and pepper to taste. That’s it. Like most cold salads, I find the flavor of potato salad to get better overnight. So I usually make it a day before I plan on serving. Cook the Potatoes and Eggs: Place a trivet in the bottom of the Instant Pot (or other electric pressure cooker) insert. Add 1 1/4 cups water. Place potatoes on the trivet. Place eggs on top of the potatoes. Set pressure cooking time for 4 minutes on high pressure. While the potatoes and eggs cook, fill a small bowl with ice and water for cooling the eggs and lightly oil a rimmed baking sheet. When cooking time completes, vent the pressure using a quick release method. Using a slotted spoon, transfer the eggs to the ice bath. Then spoon the potatoes onto the prepared baking sheet in one layer. Allow to cool. To cool overnight, cover with plastic wrap after the potatoes have stopped steaming and place in the refrigerator. 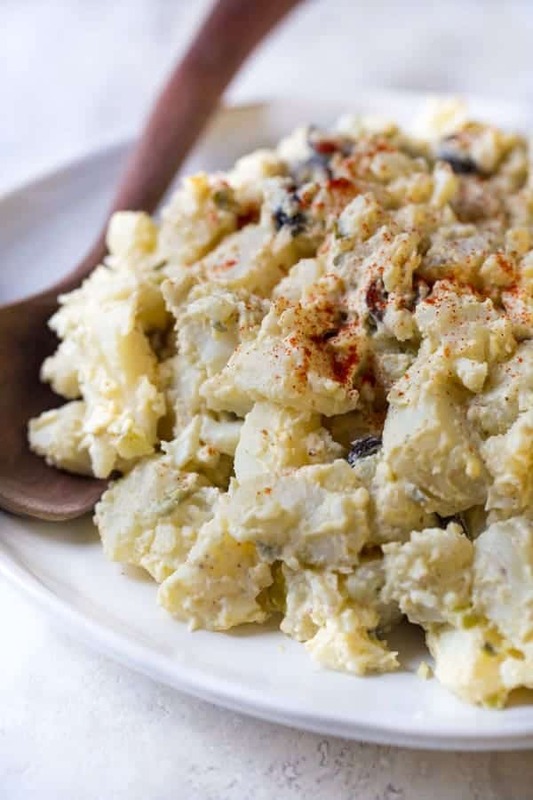 Make the Potato Salad: Peel and chop the eggs. Combine mayonnaise, onion, relish, olives, and mustard in a large bowl. Stir until blended. 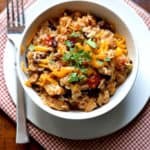 Add potatoes and eggs. Stir to combine. Add salt and pepper to taste. Spoon into serving dish. Sprinkle smoked paprika over the top. Serve chilled or at room temperature.